Roofs are extremely vulnerable to pest bird infestations since they offer these creatures plenty of space to make their home. Most roofs are also typically unprotected, meaning pest birds have an easier time of roosting there. However, Pest Solutions are on hand to ensure that every inch of your property is always fully covered against these troublesome visitors. Most people rarely think about their roofs, since they typically sit out of sight. To pest birds, though, these large spaces present a tempting target to roost and nest. If you suddenly find that your property is being swarmed by birds, then it will often be because a large flock of them have decided to use your rooftop as their new home. Of course, this can lead to plenty of problems for anyone below, as pest birds often carry a multitude of diseases and their fouling presents a similar health hazard. Even worse, nesting gulls may become aggressive when guarding their chicks, and thus swoop down to attack members of the public on the ground. Rather than allowing them to take control of your premises, it’s time to do something about the problem- and at Pest Solutions, we can help you to do just that. Pest Bird Control for Roofs: How Does It Work? Our pest bird control process for roofs typically begins with a free survey by one of our expert pest control technicians. By taking a close look at your property, as well as analysing the pest bird problem in question, they will be able to come up with the ideal solution to meet your unique needs. These surveys are no-obligation, so there’s no pressure to take us up on our offer. However, the vast majority of clients find that they are so impressed by the knowledge and professionalism of our surveyors that they are happy to go ahead with the project. The most common form of pest bird deterrent that we install at Pest Solutions is bird netting. This is particularly suited to roofs since it can quickly and easily cover a large area and keep pest birds of all sizes from getting through. Aesthetic concerns are less of an issue with rooftops, which therefore makes bird netting all the more applicable. 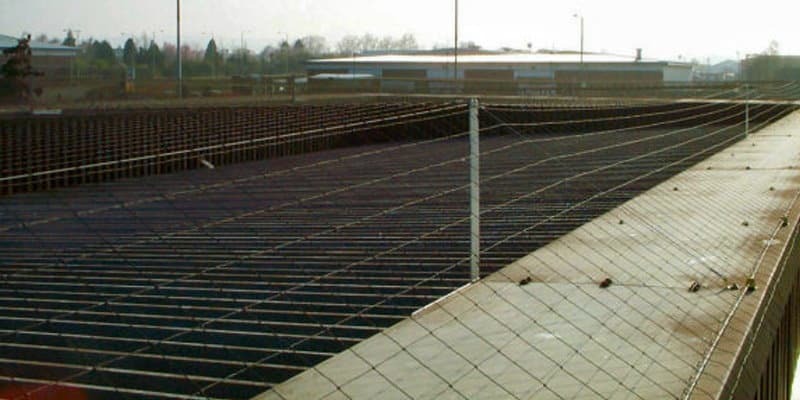 Netting is also a highly effective long-term solution, as when properly fitted it can last for up to 10 years before it needs to be replaced. That being said, netting isn’t always the best option. For instance, if you will need regular access to the roof for maintenance purposes, then bird netting may well end up getting in your way and causing a problem. There’s no need to worry, though- at Pest Solutions, we’ve got an unparalleled range of pest bird control options to choose from. Bird spikes are typically used to protect your property against larger species of pest birds- namely feral pigeons and gulls. While they may look intimidating, they don’t actually cause any harm to the birds themselves. Rather, the aim of these spikes is simply to stop pest birds from landing on ledges by acting as a physical barrier. Gulls and pigeons need to be able to spread their wings to land or take off, and with spikes in place, they lack the necessary space. Bird wire works in a similar way, as the wires are placed just close enough together that any roosting birds will have a very difficult time of getting comfortable. Other pest bird control methods stop the birds from getting anywhere near your rooftop in the first place. Audible and visual bird scaring systems frighten them off so that they know to stay well away. Our high-tech bird free gel, meanwhile, is virtually invisible to humans but appears to birds as a column of flame that will warn them to keep clear. By selecting the ideal approach for your property, our technicians provide the optimal protection to stop pest birds from turning your roof into a home. Keep Pest Birds Away- Call Pest Solutions Today! As you can see, Pest Solutions are the ideal choice when it comes to pest bird control for roofs. Our professional technicians always provide an outstanding quality of service and work hard to keep your property pest-free in the long term. For your FREE survey, or to arrange a service call out, call us today on 0800 027 2555, and let us take care of all your pest control needs.